Now the runs that had kept me busy for the past few months are over my mood has completely bottomed out again. The excitement of pushing myself towards the finishing line has been replaced by the sense of having no purpose and nothing to aim for again. Flooding back is the sense of failure because I can’t get my arse into gear and find something constructive to do with my time. As much as I enjoyed the gym there was a purpose to my efforts, now I can’t motivate myself to go! 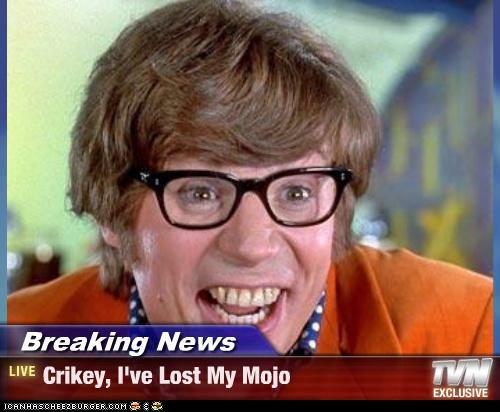 I seem to have lost my mojo again! Maybe I need to sign up for next years 10k run, at least then I will have something to look forward to again. If only I had £28 spare…. In other news tomorrow I get to finally meet someone who means a lot to me for their support and encouragement over the past 12 months. Assuming they turn up of course as meeting the moose in the real world can be quite scary! A poem or, as friends prefer to say, my lyrical therapy! I want to learn how to smile. Shared with the blogging nation. He is winning this fight. It blinds me with the light. Is all I should be feeling. To help set them free. Now I have the will! It’s written from my heart. But I will have my day in the sun. Garry has reclaimed his crown. Words ending in ion seem to weigh heavily in my life at the moment so I thought I would look into them in more detail and turn the negativity of some of them into positives. How do I motivate myself when I don’t know what it is I want to do in my life? Setting goals is an easy enough thing to do, anyone can say I want to do this, that or the other but setting realistic goals is different entirely. Are the goals I want to set myself either realistic or achievable? Are they below my capabilities or am I exceeding my abilities? What I do know is that I am an intelligent person who has spent all of my adult life wasting my abilities – that is assuming I have some of course! The bright side? It’s possible to overcome procrastination—with effort. Sheryl will agree with this ion – I do tend to put things off until there are either done for me or its a last resort. I do prefer to work under pressure BUT in jobs where that has been the case I couldn’t handle the stress it brought me, it made me ill despite me bringing in results, which in turn earned me commission and like everyone I LOVED the commission! The only thing in life I have ever really been dedicated to was playing football as a kid. I was good and had trials for professional clubs until my knee injury prevented me going any further in the game. Since then I have never shown much dedication to anything career wise, sure with my mafia wars group on Facebook I have been dedicated to that for 3 years but in that time nothing else. Does the lack of dedication come from the problem of motivation? a. The act of frustrating or an instance of being frustrated. b. The state of being frustrated. This dissection of my depression is fun! The good news is that this blog is really helping me! I have a new motivation each day to write although I didn’t post yesterday but that is more because of me not wanting to burn out rather than I couldn’t be bothered! For the first time in years I have some inspiration rather than just perspiration! I love seeing how many people have viewed my blogs but I want more viewers, more comments and a lot more people sharing my link lol. Where is the blog going to take me? who knows but it has reignited my love for writing that left me when I left school in 1995. Teachers always said I had a talent for writing and as long as I keep getting positive comments, messages of support on facebook and twitter then I hope the motivation and dedication continues because what I would like is appreciation, adulation and life free from complication! I could probably go on all day with words ending in ion but sometimes less is more!